In 1959 at the University of Cambridge, C.P. Snow delivered his (now infamous) Rede lecture on the Two Cultures of science and humanities (or his derogatory term for the latter — ‘literary intellectuals’). Although Snow was both a writer and a scientist, his lecture was largely anti-humanities. It is unclear if the divide between science and humanities has narrowed since Snow’s time, but his influence remains even in the ‘third culture’ that is trying to bridge the gap. This year, the divide was evident in Steven Pinker’s patronizing olive branch to the humanities. He advocated that “science is not your enemy”, but didn’t bother to highlight the commonalities of the two fields, only suggesting how the humanities can be more like science, without any serious discussion of what science can learn from the humanities. I feel like this is not productive, and if we want unity then we should look for lessons in both directions. A good starting point is to look at an ongoing crisis in science — the replicability crisis in psychology — and see if the humanities can offer some insight. Unfortunately, my knowledge of literature is limited to popular culture, and so I will turn to Sherlock Holmes. Holmes is not new to psychology; psychologists evaluated the fictional character’s IQ (Radford, 1999), tested the rigour of his methods (Snyder, 2004), used him as a quintessential model of expertise (Didierjean & Gober, 2008), and even suggested that neuroscientists are just like Holmes in their search for clues about the brain’s innerworkings (Kempster, 2006). It is not surprising to see so much cross-talk between psychology and literature because in many ways we can think of both as ways to explore and share insights into human nature. Of course, I am far from unique in suggesting this, there is at least one popular blog — Maria Konnikova’s Literally Psyched — that draws insights from literature and tests those insights with psychology. Maria can’t resist Sherlock either, recently publishing a self-help book offering you the secrets to a Holmesian mind. However, my goal isn’t to learn secrets to good science from the fictional character’s deductive prowess. Literary analysis is concerned not only with reading works of fiction but also understanding the factors surrounding their creation and popularity. This is where Sir Arthur Conan Doyl‘s creation is truly exceptional because Holmes lives beyond Doyle’s 56 short shories and 4 novels, the quintesiential example of a successful fandom full of countless retellings and fanfictions. Although not the first fictional detective, Homes (and Watson) has become an archetype for the genre and fuelled the golden age of detective fiction. Even C.P. Snow’s first work is a whodunit with Finbow as Homes and friend Ian Capel as a Watson-like narrator. At times, I like to think of science as a narrative. Whereas the narratives of literature are shaped and restricted by our introspection and intuitions about the human condition, the scientific narrative is constrained by experiment. And just as in culture, in science the influence is bidirectional, some works of literature not only reflect but also affect our nature, similar to Karl Popper’s note that scientific theories laden our observations. Finally, by explaining the seen in terms of the unseen, scientific theories create a rich set of characters. The beauty of good science, is that its characters — like Sherlock Holmes — are clear, detailed, and relevant. We can predict how these characters will behave in settings other than the one the original author placed them in — even if I haven’t ever seen how a certain ion behaves in a certain type of magnetic trap, the rich characterization of ions and magnetic traps that physics provides allows me to make a prediction. From this angle, a good scientific theory is like a book with a robust fandom. Although we might identify certain scientists as the “canonical” works shaping the theory, the characters are outlined clearly enough and are relevant and interesting enough that other scientists can develop them and carry them forward. As they build on these theories, these new authors also inadvertently place characters in the same or similar settings as previous, and verify their grounding by replicating experiments. However, this replication is a consequence of good science, and not its cause. Psychologists believe that they can solve their replicability crisis by requiring or directly encouraging the replication of experiments. You can certainly try to build a fandom by placing direct economic incentives to rewrite existing works. However, I doubt that will address the real issue. To me, it seems that the underlying theory and characters that inhabit it are shallow and flat. They are not developed to a level where we have an idea of how to place them in different settings, or where we have an attachment or fascination with the characters beyond the immediate rewards of individual stories. Much of the theorizing in psychology does not extend beyond a single experiment or a few very close experiments. Although some themes propagate across theories (such as the cognitive science view of mind as software, or the behaviorist view of input-output relationships), specific characters are not shared or developed by different authors. I believe that it is this depth of theory that needs to be addressed in order to make psychology a richer and more robust science, and then replication will follow as a side-effect. However, just trying to treat the symptoms of replication will not cure the disease. Of course, my prognosis is not limited to psychology, a similar (although maybe less pronounced) lack of theoretical depth is present in biology. However, there is enough in place that I can see a path forward for how the ideas of cstheory can guide us towards a more solid grounding. The danger is the urge to always develop my own worlds instead of expanding on the work of others. When I was in high school, I would entertain myself by writing on what has now become FanFiction.net/FictionPress.com (they were a single site when I started). I enjoyed the external constraints of writing sonnets, much like my current enjoyment of the extra constraints of mathematical clarity, but I never saw the point of writing fan fiction instead of new stories. Now I realize the importance of understanding and expanding upon other’s characters and settings, whether is be single-domain tools like query complexity or cross-disciplinary connections like the computational complexity of evolutionary equilibria. Unfortunately, a big fandom is guided by more than literary quality. I doubt that many would consider Twilight to be a pinnacle of literature and character development, and yet its fanfiction transformed into the hugely successful Fifty Shades of Grey. Science, like any other human enterprise, is subject to fads and bandwagons and no simple rule exists for seperating the good from the trendy — another thing that we can learn from the humanities. Didierjean, A. & Gobet, F (2008). 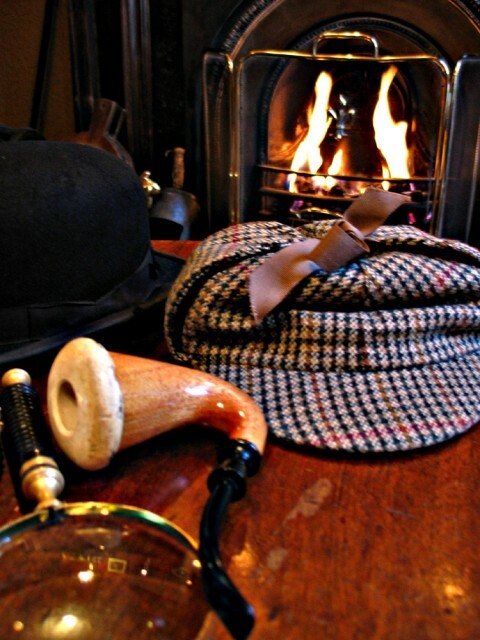 Sherlock Holmes — An expert’s view of expertise. British Journal of Psychology 99: 109–125. Radford, J. (1999). The Intelligence of Sherlock Holmes and Other Three-pipe Problems. Sigma Forlag. Snyder LJ (2004). Sherlock Holmes: Scientific detective. Endeavour 28(3): 104–108.